We know time is money, and every day can be one big rush! Sometime's there's not enough time in the day, so you want to everything in an instant fix, wherever you are, whenever you ready! It's literally all about the speed, the maximum entertainment value and the fastest wins! Luckily Moon Bingo and its sister sites have thought of everything in advance, from instant downloads, to instant play, to instant games to fast cash withdrawals, to accessing everything on the go! Now the brand is stepping up the speed stakes with the extra special launch of Speed Bingo! 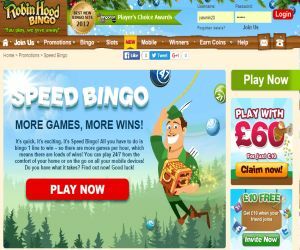 Moon Bingo and its sister sites like Robin Hood, Polo, Loony, Sugar, Gossip, Silk, Cupcake, Diva Bingo and Bingo Giving are all stepping up their game and putting the accelerator to the floor with the brand new Speed Bingo launch! From today there will be more exciting live games per hour, and all you have to do is bingo one line to win! So now you can join Robin and help him on his merry adventures, quicker, get your cupcake or sugar bingo fix in a rush, or fasten your seat belt to race through Moon Bingo to winning finish line! Now you can enjoy more live adrenaline-rushing bingo entertainment, even more fun and more jackpot wins! So there's even more chances to feel the winning rush! You can access all the pulse-racing games anywhere, anytime, from the comfort of your own home or on your mobile devices, 24/7! You can buy a maximum of 96 tickets for the room and access the games in an instant from the Live Bingo Tab! So whether your waiting for the bus, waiting for your spouse to get ready, or have a cheeky few minutes of time on your hands, you can speed into bingo, anytime you wish!